You’re probably here because you want a fun Jewish getaway. Well, good news: Trippo Hippo is loaded with ideas for your families Sukkos trips, Pesach trips, and vacations. Just follow the Hippo to your next adventure tailored for the Frum Family! Hershey has so much to do in the immediate vicinity, that we felt the need to write up an itinerary separate from our Lancaster trip notes. Some of the hotels in the Hershey area are especially family friendly, and you can spend a whole day taking advantage of the hotel waterparks, pools, and entertainment. Of course, there are tons of great attractions right nearby too to keep the adventure seekers happy. If you are visiting during the busy tourist seasons, Kosher food and Minyanim are usually easily available too. Driving to Hershey, PA takes about 3 hours from Brooklyn, Monsey, Lakewood, and a bit longer from the Five Towns, so plan some entertainment for the car. We still like the traditional “I went to Israel and brought with me Apples, Balloons, Cats, Donuts…” Sometimes we play the other ABC game where we work as a group to find the letters of the alphabet in order, on signs, license plates, etc. 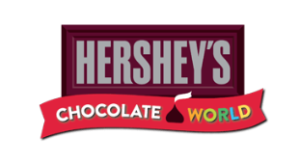 When you finally arrive at Hershey, stop first at Hersehy’s Chocolate World. After waiting on a longish line, you’ll get to sit in cars along a track and ride through a memorable tour of how Hershey’s chocolate is made. This ride is free and they offer chocolate samples at the end of the ride. (We like to come armed with our own Cholov Yisroel version to keep tantrums at bay when they see the chocolate being handed out.) The rest of the Hershey Museum requires admission payment, and was not so impressive, especially the Imax which we found to be silly and unnecessarily scary for kids. So after enjoying the Hershey ride, we recommend continuing on to a more worthwhile attraction. 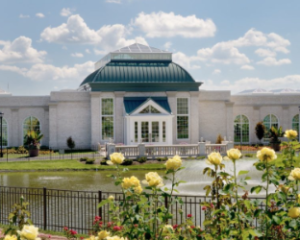 We like the Hershey Gardens which is located right neat the Chocolate Tour you just enjoyed. If you brought along lunch from home, you can enjoy it on the picnic tables at the entrance before you go into the Gardens. Food is not permitted once inside the gardens, although they do sell drinks. You can spend around an hour and a half walking along the one-mile path of the beautiful themed gardens. The kids will enjoy The Children’s Garden, with its Hershey kiss-shaped water misters, and the Butterfly Atrium. 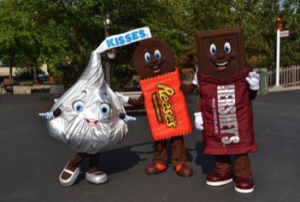 If you still have energy, you can take advantage of Hershey Park’s Preview offer: The night before your full day admission, you can enter the park 2.5 hours before closing, or 3.5 hours when it closes at 10 PM. By now, you’ll be ready to settle into your hotel. We like the Sheraton Harrisburg Hershey Hotel, and since they have both an indoor and outdoor pool, you might get lucky and find one of them empty for a night swim. If you’re staying during a peak vacation season, you should be able to form minyanim in the hotel. If not, Kesher Israel is just 15 minutes away from the hotel, and has daily Minyanim for Shachris, Mincha, and Maariv. You can’t rightfully say you vacationed in Hershey without visiting Hershey Park. Tickets are expensive, so we recommend getting them through Kosher Mart for a discount. If you get to the park right when they open at 10, you may beat the crowds and get to enjoy the water park for a bit. 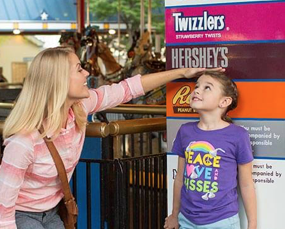 Hershey Park is a large amusement park with loads of rides, attractions, and shows. Tip: bottled water is expensive in the park, so freeze and bring along your own to save money. Enjoy a pizza lunch from Kosher Mart right at the entrance to Hershey Park, and then checkout Zoo America North American Wildlife Park. Little know secret: Your Hershey Park tickets include free admission to this zoo! If you don’t end up fitting in Zoo America on Day 2, and you plan on enjoying a 3rdday in Pennsylvania, try something different, and drive up to Lake Tobias Wildlife Park. It’s about 50 minutes from Hershey and closer if you’re staying in Harrisburg, and it’s well worth the trip. It is a reasonably priced zoo with a nice variety of exotic animals. They also have a petting zoo and an adorable baby animal section. In addition, they have an excellent safari (for an additional fee), where you get to interact with the animals at close range. You can make a whole day of it. Learn how chocolate is made on a FREE tour. You ride on a track through a beautiful display of how Hershey’s chocolate is made. And of course, you get a free sample chocolate at the end. Hersheypark is famous for its thrilling rides and attractions, water fun and live entertainment. Try getting to the park early in the day to avoid the long lines. You also may be able to beat the crowds to the water park if you get there early enough. This family entertainment center is located along the beautiful countryside with waterfalls and flowers. They offer indoor and outdoor sports like go carts, mini golf, outdoor laser tag, bumper boats, an escape room, batting cages, and more. ZooAmerica is included in your one-price admission when you visit from within Hersheypark, or you can choose to visit only the zoo and pay separately at the off-street entrance. They have over 200 animals, they offer a behind-the-scenes animal tour, and they have a reptile petting exhibit. If you’re into botany, and even if you’re not, you’ll enjoy the beautiful variety of seasonal displays and you can explore themed gardens. The kids will love the indoor, tropical Butterfly Atrium, and the hands-on Children’s-Garden. Lake Tobias is a half hour away from Harrisburg, PA. It is a reasonably priced zoo with lots of exotic animals. They also have a reptile show, a safari (for additional fee) a petting zoo, and a baby animal section. Central PA’s Kosher Martduring peak tourist seasons. Kosher Mart also delivers to hotels, and they also sell discounted park tickets. Checkout their website for details or call (717) 951-3297. They sell burgers, fries, salads, etc., located in the park. You can get a free half hour shopper entry pass into the parks to access the restaurant. Kosher Mart also sells Three G’s Pizza – take-out only pizza. There is a also Giant Food Store on Linglestown Road, which has a Kosher bakery, fish and frozen poultry and meat, kosher cheeses. Note: their deli counter says Kosher, but it is not under Hashgacha. The Kove at Dickinson College in Carlisle PA. They sell KOsher VEgan food (hence the name Kove) under the StarK. They sell lunch and dinner Sunday-Friday in the HUB dining hall when the college semester is open. During peak season, there are usually multiple Shachris minyanim in the popular hotels and resorts. If you stay in Harrisburg, you can find regular minyanim at Kesher Israel synagogue http://www.kesherisrael.org. They offer a daily Minyanim for Shachris, Mincha, and Maariv. You can also usually catch Mincha at 6 PM at Hershey Park Drive at the Kosher Restaurant, near the entrance to the park. You can count on minyanim there during peak season. They only have 3 suites, so reserve early. They have an indoor and outdoor pool. by Hilton in Harrisburg- they have 1 or 2 bedroom suites with a kitchen. They also offer free breakfast which usually offers kosher cereal and fruit. This is a great intinerary! In general a great vacation.